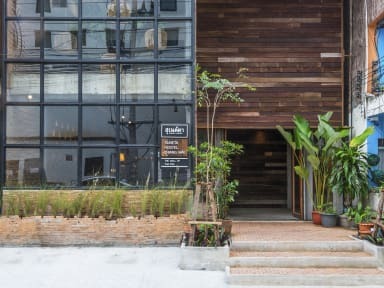 Suneta Hostel Chiang Mai i Chiang Mai, Thailand: Bestill nå! Chiang Mai, Here we come! Thailand's northern capital, despite the constant arrival of planes and trains full of sightseers, the former seat of the Lanna kingdom is still blissfully calm and laid-back. This is a place to relax after the chaos of Bangkok and recharge your batteries with fabulous food and leisurely wandering. 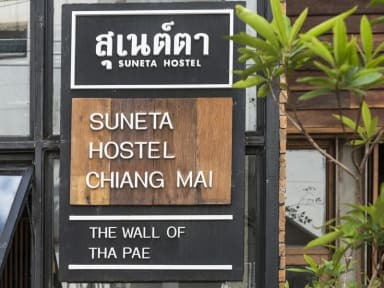 Suneta Hostel Chiang Mai is our 3rd Branch of Thailand's most famous hostel (1st Chiang Khan and 2nd Khaosan branch) in the city of culture, nature and night life. Our new branch is located at Chiang Mai significant historic landmark ''The Tha Pae Gate". It takes only 3 minutes to walk to Tha Pae Walking Street (Sunday Night Market) and it takes only 10 minutes drive from Chiang Mai international airport. Wandering around in the town of superb local food, temple sightseeing, trekking tour, rock climbing and caving or wherever you want to go will be very easy when you stay with us. We provide the wide lobby area for meeting and talking with the fellow travelers ,the outstanding sanitary restroom and bathroom, and free WiFi is available in all area of our hostel. Thanks to free high speed Internet, especially for our guests, you can keep in touch with your friends and family through out the world.